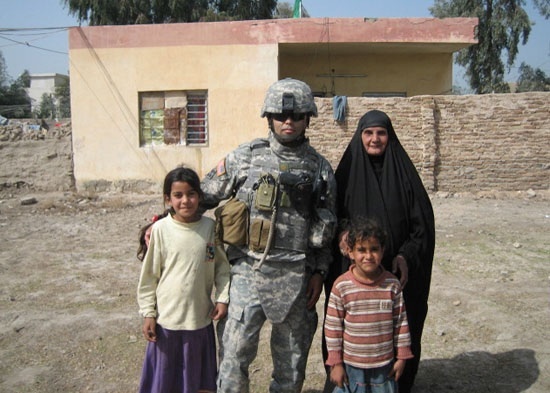 Almost immediately after returning to the United States from his third tour in Iraq, Lt. Col. David Yebra was assigned Sam Houston State University’s military science department leader position. Yebra, who completed the application process while in Iraq, was offered the job at SHSU upon returning from Iraq in February. “I love it already, and I’m trying to get a fourth year out of this deal,” he said. A native of Tuscon, Ariz., Yebra’s 19 years of army experience has sent him all over the United States and the world. After receiving a Bachelor of Science degree in civil engineering management at West Point, he was stationed in Oklahoma, New York, and Kansas, as well as Bosnia, Germany, Hungary, and Croatia. He also earned his Master of Science degree during this time from Long Island University. Yebra was also stationed six years at Fort Hood, Texas, with the 4th Infantry Division, with which he toured three times to Iraq. “The Fourth Infantry Division is responsible for Baghdad, and at any given moment of the day, is the most lethal organization in the world with aircrafts, artillery, its number of soldiers, weapons and body armor,” said Yebra. Throughout his three tours in Iraq, Yebra’s unit duties evolved from a dangerous invasion into the reconstruction of the city of Baghdad. Though opinions on the war in Iraq are varied, Yebra believes there are misconceptions about it due to the fact that not all aspects of activity in Iraq are in the news for Americans to see. Upon his arrival at SHSU, Yebra said he was immediately impressed with what he saw, though he was new to the university ROTC scene altogether. “I heard about SHSU’s ROTC support, but it has far exceeded my expectations. The faculty alone is beyond what I could have imagined,” said Yebra. 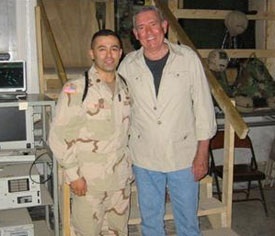 Yebra with SHSU alumnus Dan Rather in Iraq in 2003. “I’d like them to learn all they can while they are here and to take it with them when they leave,” he said. “Dealing with media, understanding money, understanding cultures, conflict-resolution, and procedures for law and order are some of the skills that these cadets will need as they enter the army. “The program is already very strong because of the leadership that has preceded me, but I do want to concentrate on some specific things,” said Yebra. Another thing Yebra wishes to focus on is sharing the accomplishments and events of the ROTC with the outside community. “I want to show the importance of the work that SHSU is doing for the program, and how it is contributing to a parent’s son or daughter, and their development as an army officer,” said Yebra. Yebra is excited to continue his military career at SHSU with his wife and three children, who will join him in Huntsville at the end of June. His oldest daughter will also become a Bearkat in the fall as part of the freshman class. “I enjoy what I do, I enjoy the people I work with, and I enjoy the opportunities it gives me. I’m more grateful than I could ever express for the support, especially from SHSU,” said Yebra.